Venezuela's Guri Dam, which supplies about 60 percent of the nation's power demand, recently hit a historic low of 243 meters. In an effort to reduce power consumption President Maduro has reduced work hours of public servants and has asked women to air-dry their hair and laundry. "Water is gold now" said one Venezuelan, recounting how he and his desperate neighbors, victims of the nation-wide water shortage that has left faucets dry and created rolling black-outs, hijacked a hotel water truck. Concern is mounting that the drought in Brazil's Corn Belt could result in a reduced safrinha corn crop, a second crop planted after soybeans, which would put additional strain on Brazilian livestock producers who are already facing record corn prices. Yet another stress point as well, perhaps, for Brazil's President Rouseff who currently faces impeachment proceedings on charges of manipulating government accounts. In Chile demand for liquefied natural gas rose sharply as hydroelectric generation fell 21.8 percent in February. Between 800,000 and 900,000 hectares of soybeans will go unharvested in Argentina - the world's leading supplier of soy oil and soy meal - as heavy El Niño rains pounded nearly half of the country's soy fields, destroying crops, delaying harvest, flooding roads, and threatening disease. On April 11 of this year 612 trucks of soy arrived at export docks, down from 4,273 trucks on the same day last year. The 3-month maps (below) for the same 12-month period illustrate conditions in more detail. Deficits in Colombia, Venezuela, Guyana, Suriname, French Guiana, and western Brazil are forecast to moderate somewhat April through June. 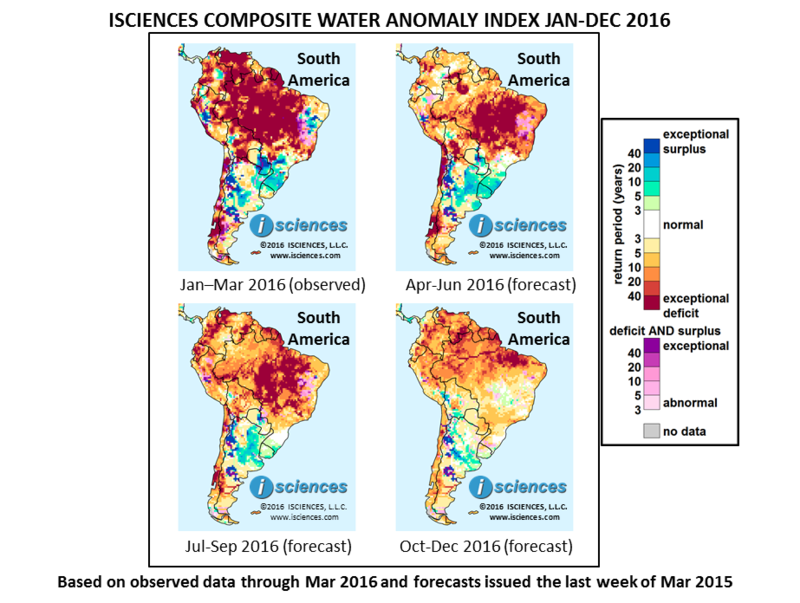 Much of northern Brazil and Chile will continue to experience drought conditions. Surpluses will persist during this period in central Paraguay and Rio Grande do Sul, Brazil. Surpluses are forecast to emerge throughout Uruguay, in the Ibará Wetlands of eastern Argentina, and in the state of Buenos Aires. From July through September deficits will spread in Ecuador, Colombia, Venezuela, Guyana, Suriname, and French Guiana, which may be severe to exceptional in many areas. Deficits will persist in Peru, Bolivia, Chile, and much of Brazil, though deficits in Chile are expected to be somewhat less severe. Rio Grande do Sul, Brazil may transition from water surpluses to nearly normal conditions. Surpluses will diminish in Uruguay but central Paraguay and much of northern Argentina will remain wet.